January 29, 2015 January 28, 2019 Posted in food. One of my chief pleasures as an adult has always been working in a yard. I love everything — designing, planting, maintaining, and sitting outside, viewing. Our previous home was located in Austin’s suburbs, a great place for good schools, big houses, and deer. The deer lived in the greenbelt that surrounded the creek down the hill. They were fun to watch, coming back year after year to birth their fawns in our yard. Unfortunately, they also completely annihilated the landscape. They ate or destroyed everything; the only truly deer-resistant plants I ever found were ornamental grasses, cacti, and rosemary. Everything else, at some point or another, was fair game on the deer buffet. I had no blooming flowers to pick, no garden to plant…though the yard looked very nice, and I enjoyed working in it, my heart pined for more. For 14 years, I pined. And then we moved. Here, in the central city, there are no deer. My only limitations are space, the type of soil our lot has, sunlight, and drainage. For the first time, I even have a vegetable garden, so I’m discovering what and when to plant. We’ve had some interesting successes, and even the failures have been enjoyable. I needed to harvest this fennel bulb, as I was afraid that recent warm weather might cause it to bolt. 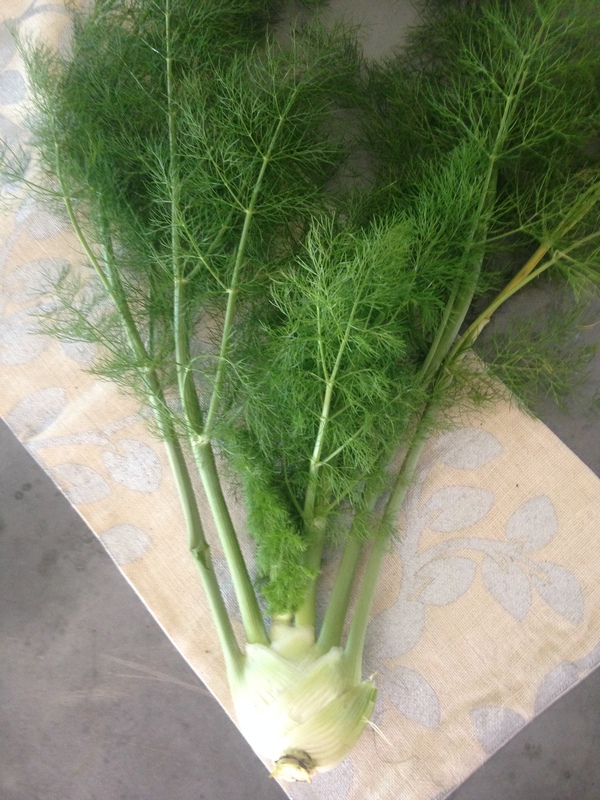 Last night, I harvested some of our fennel. The plant was truly beautiful — it looked better than many I’ve bought at the store. And it was fresh; its divine aroma filled the room as I sliced and chopped, all undoubtably heightened by the fact that I’d gathered it from my own yard just moments before putting it in the pot. As I cooked the soup over the next hours, I was profoundly satisfied. The recipe came from Lucinda Hutson’s amazing collection, The Herb Garden Cookbook: the Complete Gardening and Gourmet Guide. 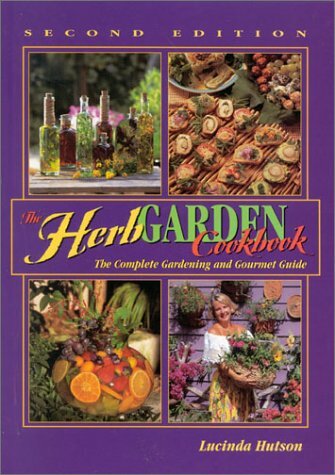 Years ago, I attended a talk at Austin’s premier organic garden center, Natural Gardener, where the author spoke on planting a kitchen herb garden. The notes I took are drawn on the book’s back pages, and I aspired to follow her design, attempting to incorporate plants from our deer-ravaged landscape into my kitchen (what the kids disparagingly called “yard food” and spurned on sight). I made one modification. My husband tends to avoid eating potatoes; as I had several large golden beets from the week’s CSA box, I substituted. 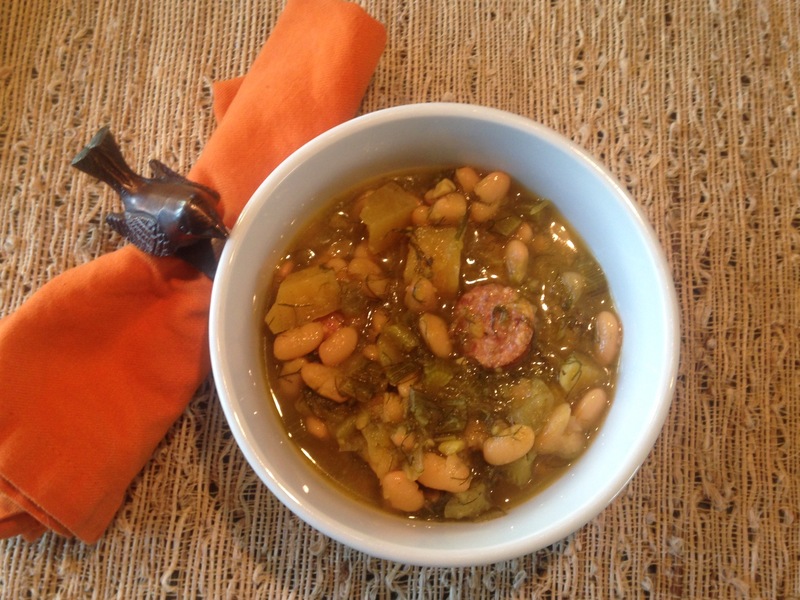 Pretty, and flavorful, this soup was a wonderfully satisfying, healthy, and gluten-free dinner. This book is now out of print, but you can find it online. Also take a look at Hutson’s most recent book, Viva Tequila! : Cocktails, Cooking, and Other Agave Adventures (you gotta love a woman who calls tequila her “soul mate”). Rinse the beans, discarding any shriveled or discolored ones. In a large soup pot, heat the oil and salute the onions, garlic, and fennel until slightly softened (about 10 minutes). Add the bay, fennel seeds, crushed red pepper, beans, and stock. Bring to a boil; turn off heat and allow to stand covered for 1 hour. Return to boil; reduce heat and simmer 1 1/2 hours. Add the potatoes and cook 10 minutes. Add the sausage and cook another 10 minutes, or until potatoes are tender. Add the sherry or Pernod and about 4 tablespoons chopped fennel leaves. Salt and pepper the beans to taste. Remove pot from heat and let stand, covered, for 5 minutes before serving. Garnish with fresh fennel sprigs. Serves 8. The finished product. It made great leftovers on cold days. I’d also say that the recipe provided more than 8 servings (or perhaps my idea of a serving isn’t as hearty). Previous: Previous post: How Do You Find Motivation When Success Doesn’t Seem to be Coming? Sounds like a delicious soup! Did you take a picture of the finished product?